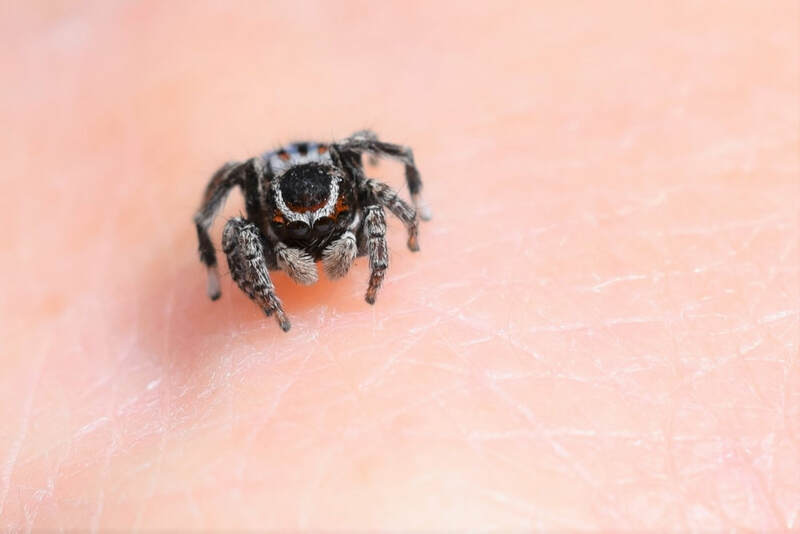 I’d read the story about how Stuart Harris photographed a new species of Peacock Spider (Maratus) in 2008, rediscovered it three years later in 2011, and subsequently had it named after him, a while ago. 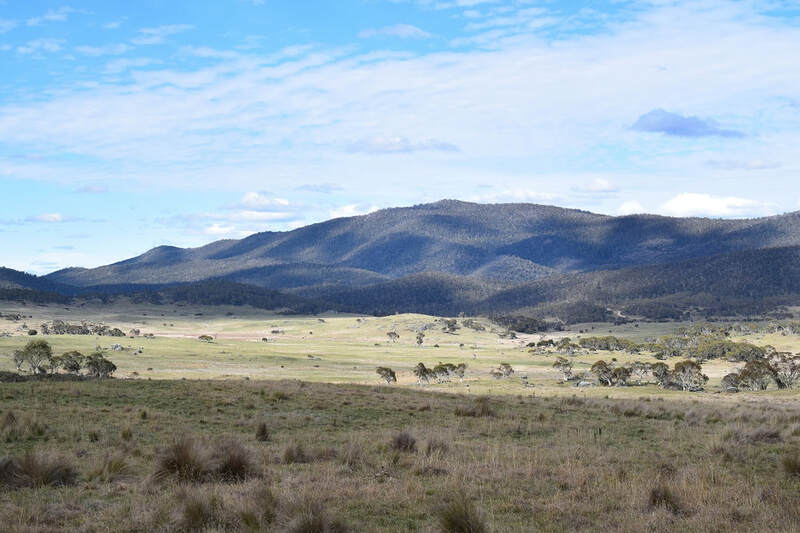 So when Big Sis and I decided to visit Canberra for the weekend, I automatically thought of Namadgi National Park, the site of the discovery. 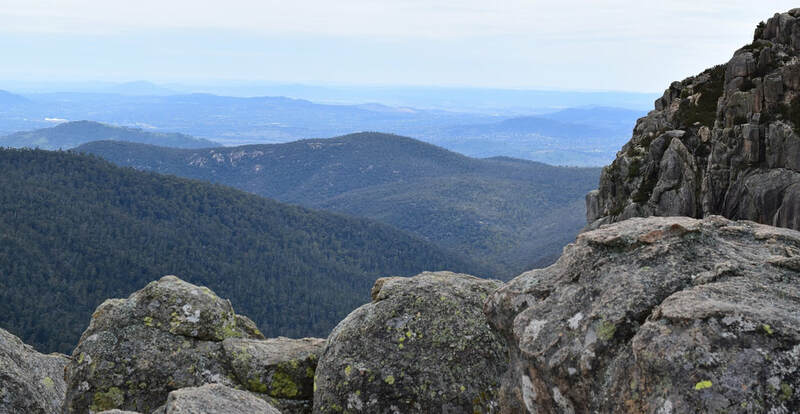 On Saturday, 7th October, 2017 we headed into Namadgi in the hopes of spying one ourselves. We never imagined that we'd be successful, but you never know unless you try. We did the Yankee Hat walking track on the afternoon of our arrival. It is a flat 6.2km return trail that meanders through open areas, small areas of scrub, and eventually leads to a quite well-preserved example of Aboriginal Rock Paintings. 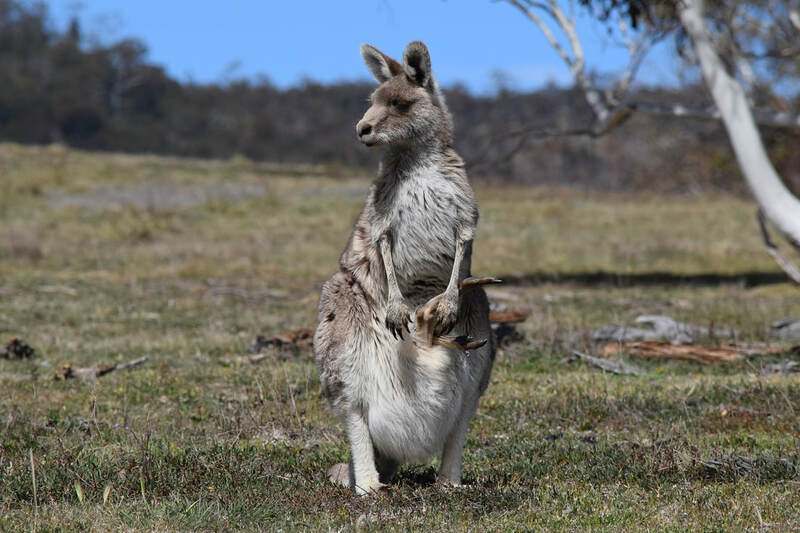 Along the way we saw the most Eastern Grey Kangaroos I have seen in my life; just about all the females with a joey in the pouch. We also saw a lot of Red-necked Wallabies. 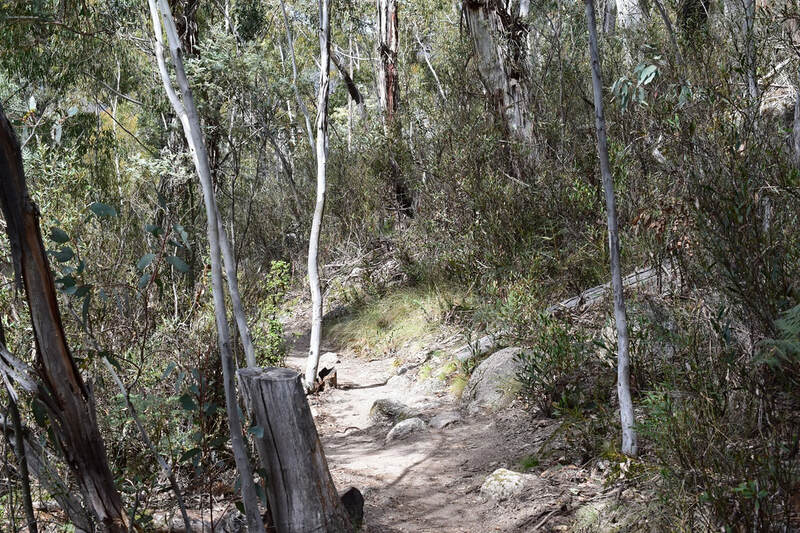 I would highly recommend this walking track for anyone who is keen to see macropods. Just keep in mind that although cute and seemingly lazy, they are still wild animals and the males can be aggressive at times. 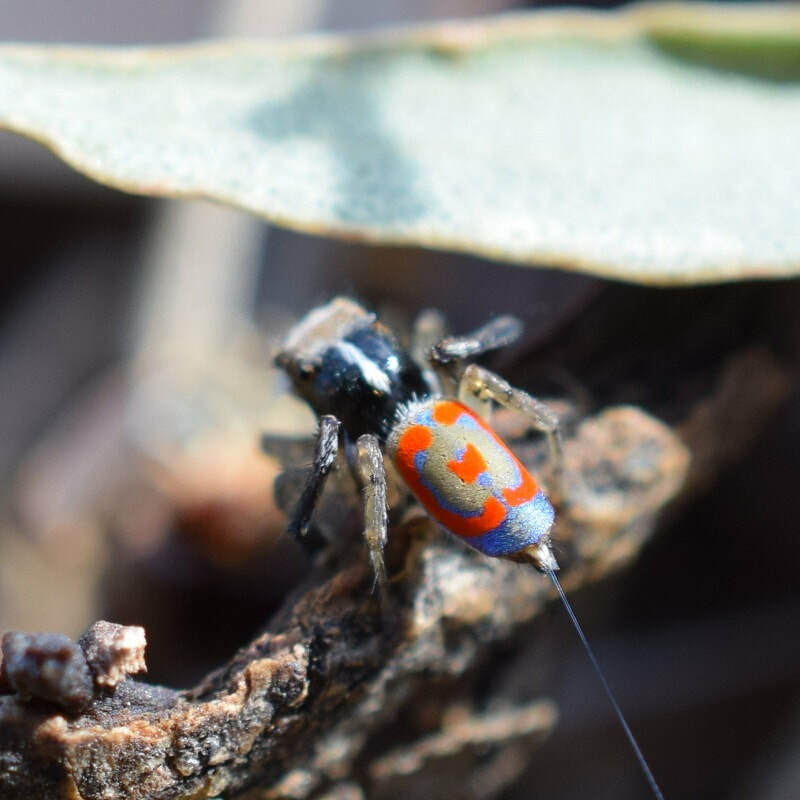 Along the way we bird, reptile and spider watched, with highlights including a Cunningham's Skink, Flame Robin and many very cute jumping spiders but not the elusive Maratus harrisi. We'd read that the species was discovered along the Booroomba Rocks track, and therefore weren't too discouraged by its absence. It was late in the afternoon by the time we finished so we went by Booroomba Rocks to check out what it was like. Venturing only about a hundred metres up the track, we found absolutely no spiders but by this time it was cold and getting dark. We abandoned the site planning on returning the next day. 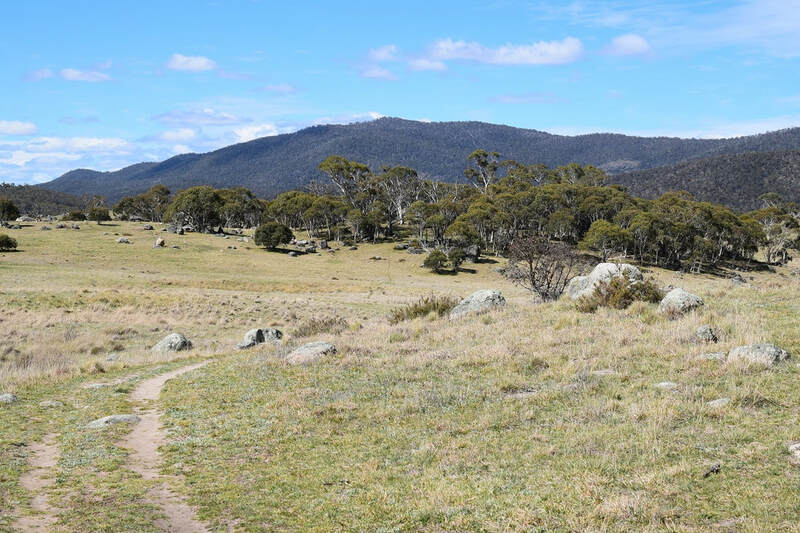 On Sunday 8th October we returned to Namadgi arriving at the trailhead at around 9:30am. This track is short at 2.5km return but is basically straight up the entire way. It ended up taking us about two hours to reach the top as we were searching leaf litter and small plants for spiders all the way along. 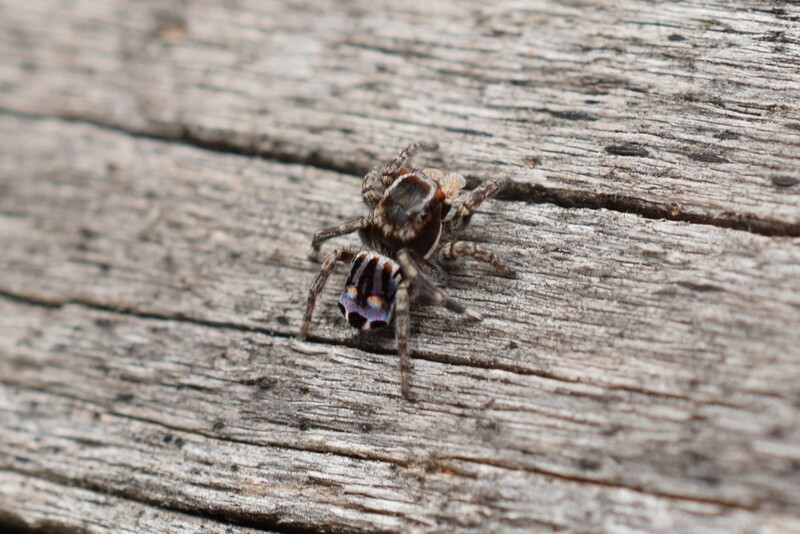 We found lots of jumping spiders including an extremely tiny juvenile well spotted by Lil Cuz. Still none of our target species though. At the top we had a rest and took in the awesome view beneath us stretching to Canberra and beyond. Perched atop the boulders that sit high above the valley we enjoyed watching a Nankeen Kestrel soar by at eye level, and thought the trek up the mountain was well worth it despite our lack of luck with our tiny friend. After a while we thought it looked like rain so we decided to start our descent. There is a picnic area at the top, and I stood there just off the track awaiting the others still climbing down off the rocks. When they joined me we were all just loitering around for no apparent reason and Big Sis said to me: "There's a spider next to your foot." 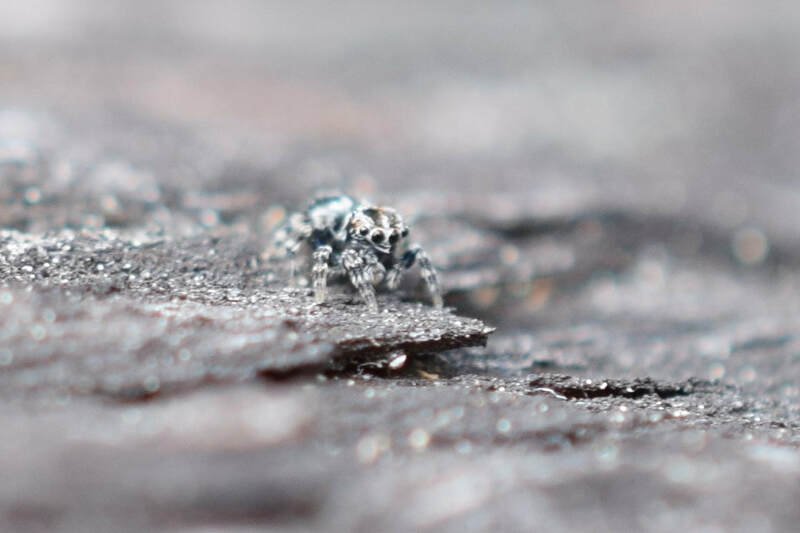 I looked down to see a tiny black and white spider that looked different to the others we'd previously seen so I bent down and said: "Oh it's really cute, I'm gonna take a picture if it." I'd stashed my camera in my backpack as it was running low on battery and I didn't want to be tempted into completely draining the battery on other things should we stumble upon a Peacock Spider. 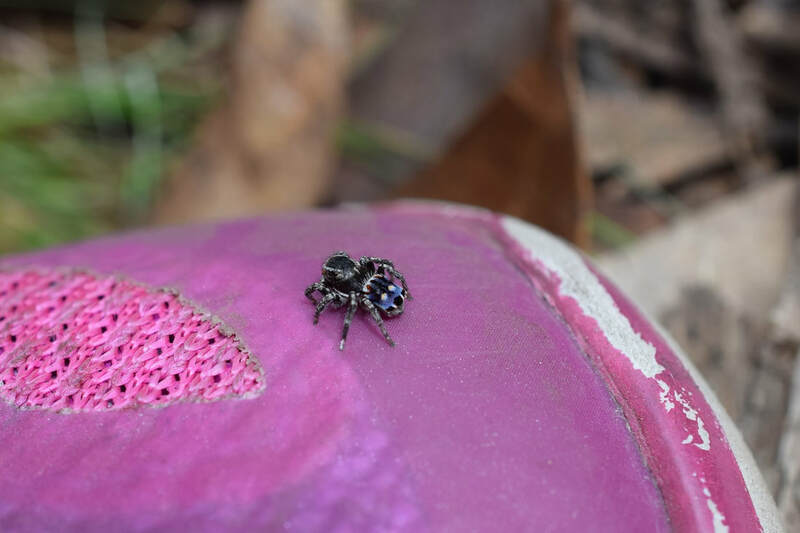 This little cutie tempted me however, and I asked Big Sis to extract my camera from my bag while I kept an eye on him. 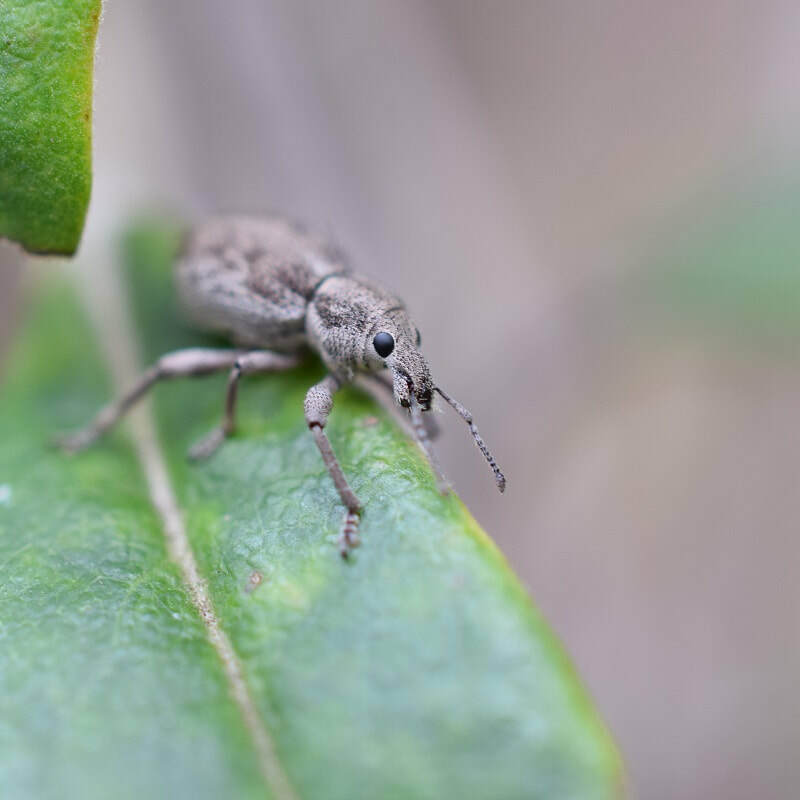 He was quite active, and with camera in hand, I pursued him to a nearby log. I snapped a pic or two and then it happened. 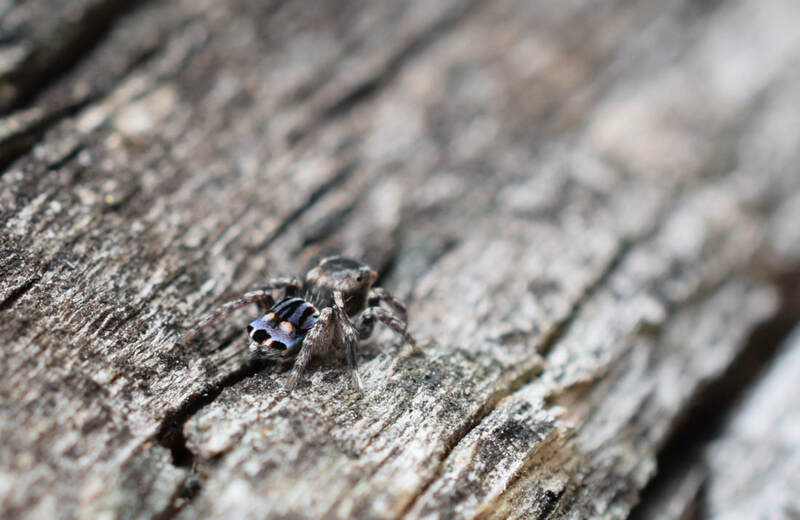 Through my macro lens I saw the little guy turn slightly revealing a bright blue/purple shine. I could hardly believe it as I cried out: "Oh my God! It's one of them!" As I furiously snapped away on my camera I called to the others to "get over here" and see it, not wanting anyone to miss out on seeing such a beauty. 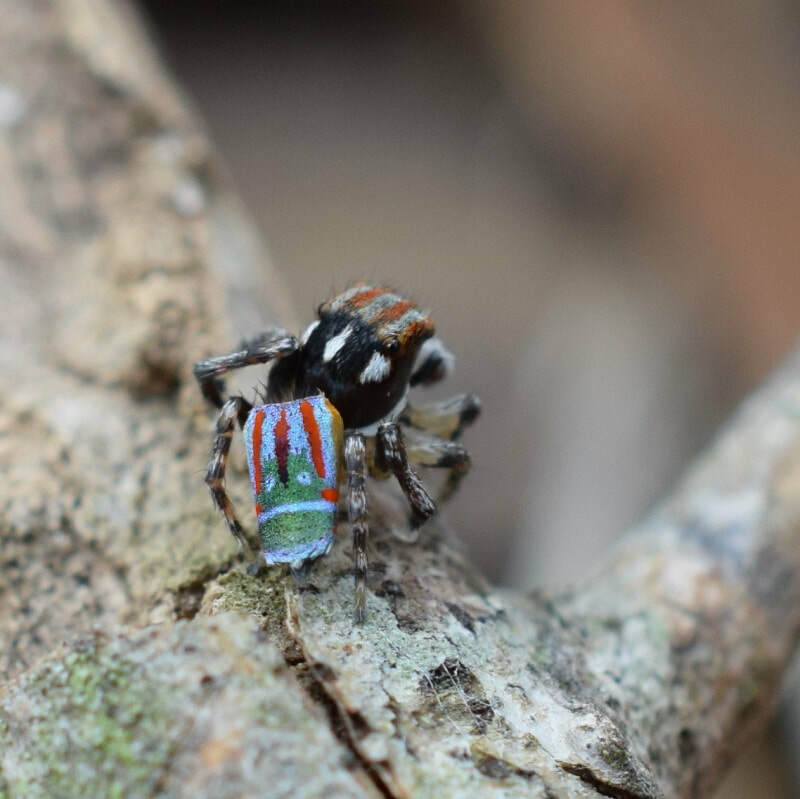 I wanted everyone to get in there and have a close look to see the spectacular and suddenly oh so obvious signature colouring and pattern of the Maratus harrisi. My heart was beating so fast and I was shaking. I could not believe we'd actually spotted one. He was very accommodating, wandering around on top of the log, and finally springing off into some bushes. We'd had such a chance encounter we couldn't complain when he disappeared from view. However, our luck was not up just yet. As we stood in the same spot all freaking out we looked down to find another one had just jumped right up onto Lil Cuz's shoe. What on earth was happening? We'd just found not one but two Peacock Spiders! 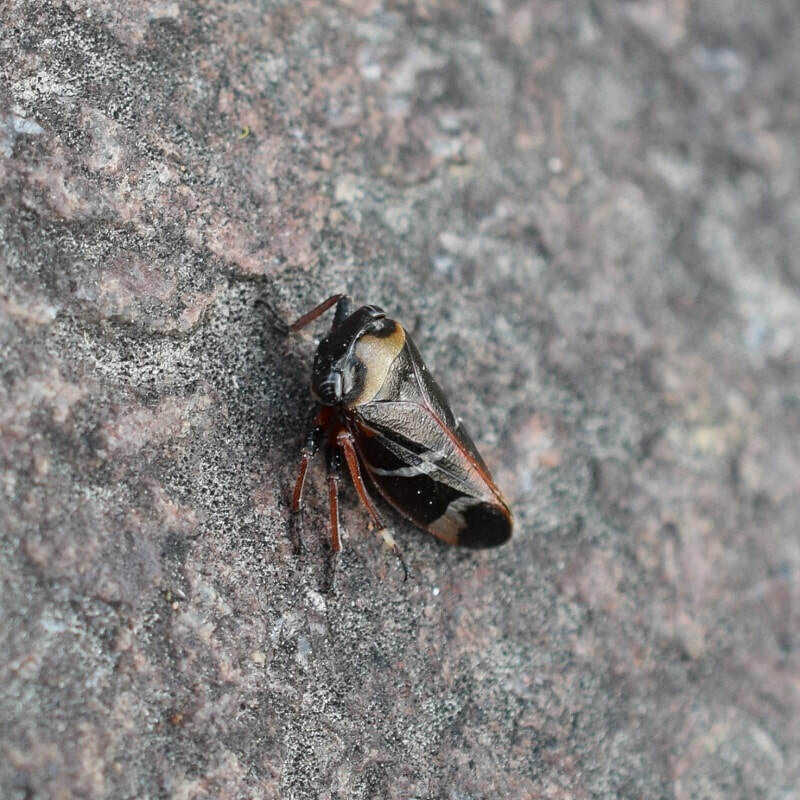 The very spiders we never seriously thought we'd actually find on a two-hour walk! Especially considering we had no idea what we were doing! After more marvelling at the tiny-ness, the vivid-ness and the cute-ness, Big Sis decided to see if she could get him to jump onto her hand. 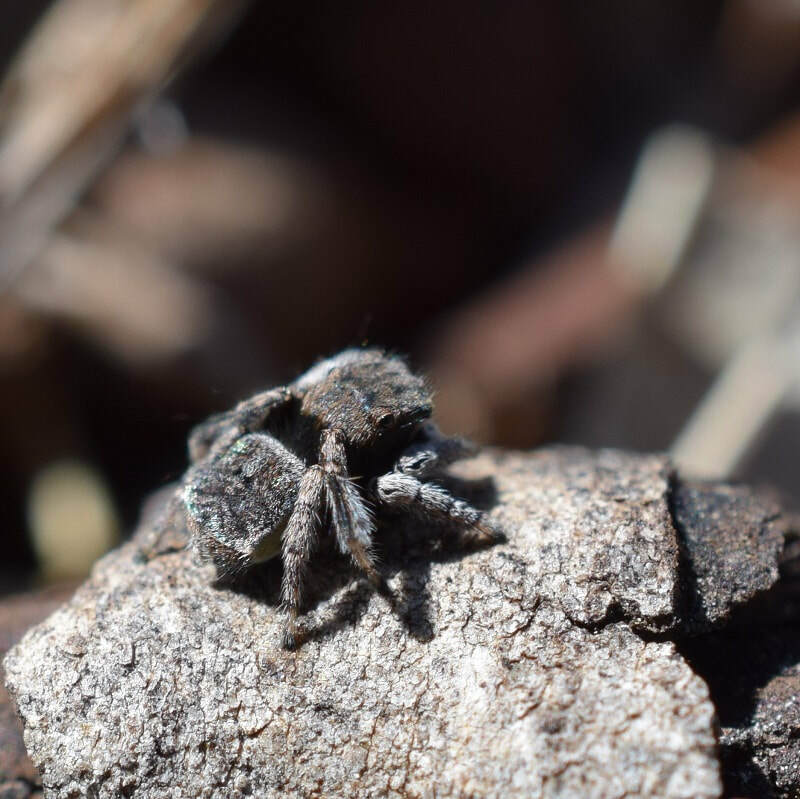 He was soon crawling all over her hand with not a care in the world allowing us even more great views of this delightful little fellow. After changing hands a few times we released him back to where we'd found him, and decided to leave him alone. We all headed off with smiles galore; still in disbelief that we'd found what we were looking for. Further on down the track we passed a man who was carrying a camera and looking at the ground all along the sides of the track. I thought I recognised him so I hurried up to Big Cuz and whispered: "Is that the guy?!" She wasn't sure but thought it could've been him too so we sped up to Big Sis and Lil Cuz who'd stopped ahead of us to look at a skink sticking its head out from the end of a log. We told them what we suspected and made the decision to go back up the track after him in order to either confirm our suspicions or look like slightly crazy stalkers. I think we ended up doing both. Big Cuz, who was braver than me, asked "Are you the peacock spider guy?" and he said "Yes." He told us a bit about the spiders we could see right there, and about how he'd discovered the resident species of Peacock Spider. I couldn't contain myself any longer and told him that we were pretty sure we'd found one at the top of the track. He was pretty excited, though perhaps a little doubtful, and seeing my camera asked if we'd taken any pictures. I showed him, and he confirmed it before producing a copy of the DVD of the movie about his discovery from his bag and giving it to me. We chatted a bit more, finding out that October/November is the peak time to see them, and then told him where we'd found today's spiders, so he could have a look for them too. We parted ways with him and were pretty amazed that we'd not only found the spider but the guy who'd discovered it too. He said he'd only been back there a few times since 2011, so it was a pretty rare sighting as well. It was a great end to an expedition that had always been filled with doubt, but had just enough hope to get us over the line. Since that weekend Big Sis and I have continued the hunt. 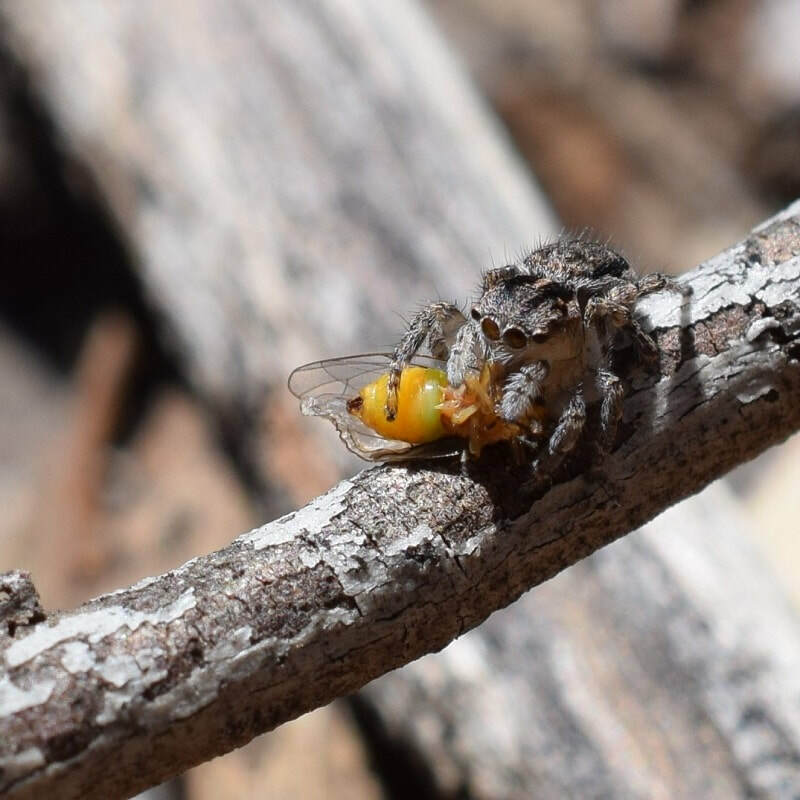 In places far off as well as not far from home we have already managed to track down five other species of Maratus with no plans of stopping just yet. 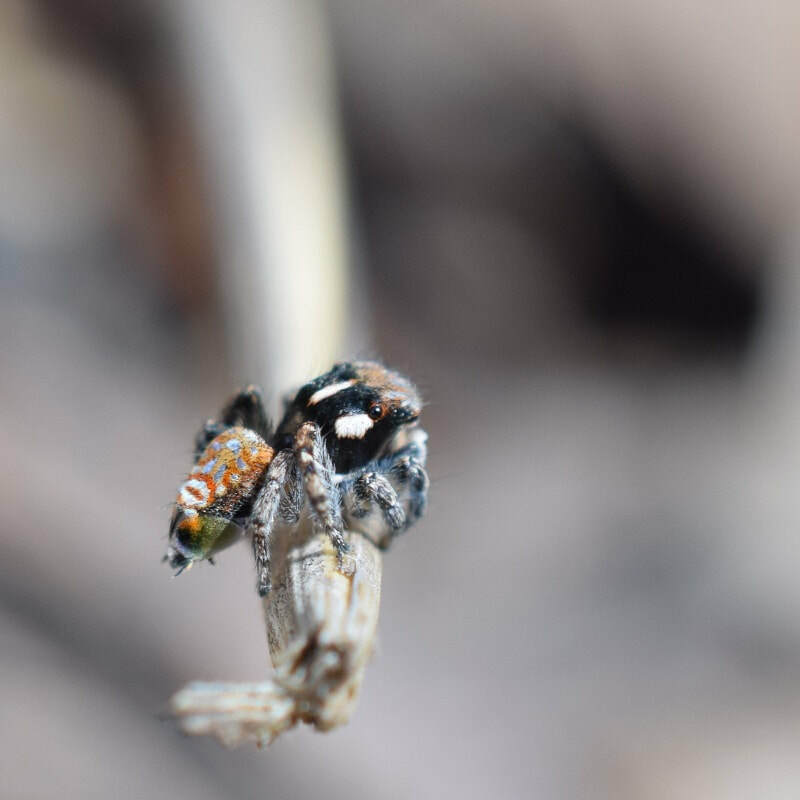 It would seem that we too have succumbed to the addiction of Maratus watching. Do you like spiders? 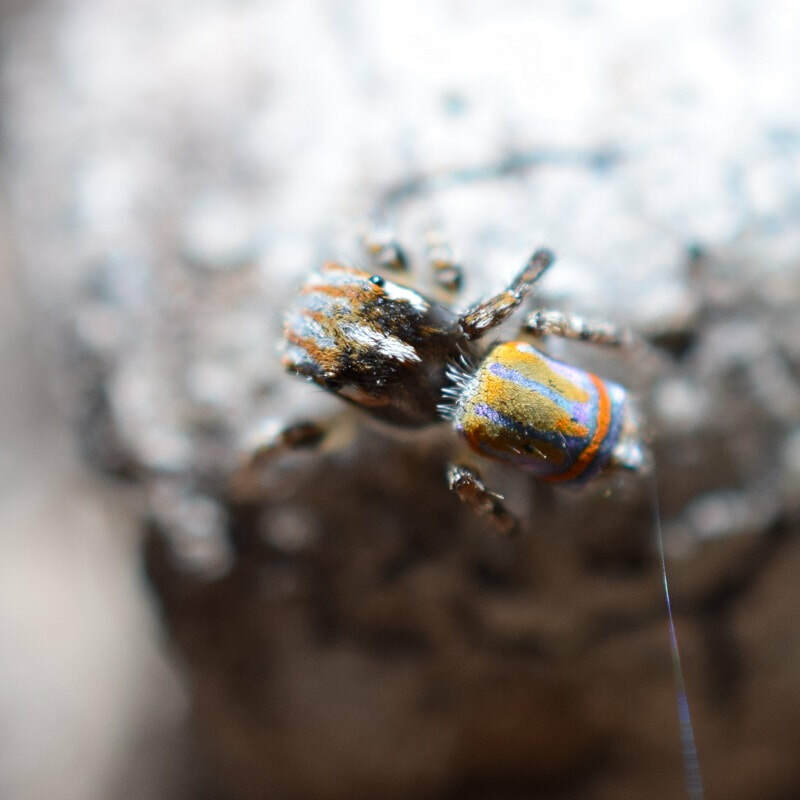 Have you ever seen a Peacock Spider? Let us know in the comments.